"Aurora Borealis" redirects here. For other uses, see Aurora Borealis (disambiguation). "Aurora Australis" redirects here. For the ship, see Aurora Australis (icebreaker). Auroras, sometimes called the northern and southern (polar) lights or aurorae (singular: aurora), are natural light displays in the sky, usually observed at night, particularly in the polar regions. They typically occur in the ionosphere. They are also referred to as polar auroras. In northern latitudes, the effect is known as the aurora borealis, named after the Roman goddess of dawn, Aurora, and the Greek name for north wind, Boreas by Pierre Gassendi in 1621. The aurora borealis is also called the northern polar lights, as it is only visible in the sky from the Northern Hemisphere, the chance of visibility increasing with proximity to the north magnetic pole, which is currently in the arctic islands of northern Canada. Aurorae seen near the magnetic pole may be high overhead, but from further away, they illuminate the northern horizon as a greenish glow or sometimes a faint red, as if the sun was rising from an unusual direction. The aurora borealis most often occurs from September to October and from March to April. The northern lights have had a number of names throughout history. The Cree people call this phenomenon the "Dance of the Spirits." Its southern counterpart, the aurora australis or the southern polar lights, has similar properties, but is only visible from high southern latitudes in Antarctica, South America, or Australasia. Australis is the Latin word for "of the South." Benjamin Franklin first brought attention to the "mystery of the Northern Lights." He theorized the shifting lights to a concentration of electrical charges in the polar regions intensified by the snow and other moisture. Aurorae are produced by the collision of charged particles from Earth's magnetosphere, mostly electrons but also protons and heavier particles, with atoms and molecules of Earth's upper atmosphere (at altitudes above 80 km (50 miles)). The particles have energies of 1 to 100 keV. They originate from the Sun and arrive at the vicinity of Earth in the relatively low-energy solar wind. When the trapped magnetic field of the solar wind is favourably oriented (principally southwards) it connects with Earth's magnetic field, and solar particles enter the magnetosphere and are swept to the magnetotail. Further magnetic reconnection accelerates the particles towards Earth. The collisions in the atmosphere electronically excite atoms and molecules in the upper atmosphere. The excitation energy can be lost by light emission or collisions. Most aurorae are green and red emissions from atomic oxygen. Molecular nitrogen and nitrogen ions produce some low level red and very high blue/violet aurorae. The light blue and green colors are produced by ionic nitrogen and the neutral nitrogen gives off the red and purple color with the rippled edges. Different gases interacting with the upper atmosphere will produce different colors, caused by the different compounds of oxygen and nitrogen. The level of solar wind activity from the Sun can also influence the color of the aurorae. Typically the aurora appears either as a diffuse glow or as "curtains" that approximately extend in the east-west direction. At some times, they form "quiet arcs"; at others ("active aurora"), they evolve and change constantly. Each curtain consists of many parallel rays, each lined up with the local direction of the magnetic field lines, suggesting that aurora is shaped by Earth's magnetic field. Indeed, satellites show electrons to be guided by magnetic field lines, spiraling around them while moving towards Earth. The similarity to curtains is often enhanced by folds called "striations". When the field line guiding a bright auroral patch leads to a point directly above the observer, the aurora may appear as a "corona" of diverging rays, an effect of perspective. Although it was first mentioned by Ancient Greek explorer/geographer Pytheas, Hiorter and Celsius first described in 1741 evidence for magnetic control, namely, large magnetic fluctuations occurred whenever the aurora was observed overhead. This indicates (it was later realized) that large electric currents were associated with the aurora, flowing in the region where auroral light originated. Kristian Birkeland (1908) deduced that the currents flowed in the east-west directions along the auroral arc, and such currents, flowing from the dayside towards (approximately) midnight were later named "auroral electrojets" (see also Birkeland currents). On July 24 2008, THEMIS probes were able to determine, for the first time, the triggering event for the onset of magnetospheric substorms that produce Aurorae. Two of the five probes, positioned approximately one third the distance to the moon, measured events suggesting a magnetic reconnection event 96 seconds prior to Auroral intensification. "Our data show clearly and for the first time that magnetic reconnection is the trigger," said Angelopoulos. Still more evidence for a magnetic connection are the statistics of auroral observations. Elias Loomis (1860) and later in more detail Hermann Fritz (1881) established that the aurora appeared mainly in the "auroral zone", a ring-shaped region with a radius of approximately 2500 km around Earth's magnetic pole. It was hardly ever seen near the geographic pole, which is about 2000 km away from the magnetic pole. The instantaneous distribution of auroras ("auroral oval", Yasha/Jakob Feldstein 1963) is slightly different, centered about 3-5 degrees nightward of the magnetic pole, so that auroral arcs reach furthest towards the equator around midnight. The aurora can be seen best at this time. The Earth is constantly immersed in the solar wind, a rarefied flow of hot plasma (gas of free electrons and positive ions) emitted by the Sun in all directions, a result of the million-degree heat of the Sun's outermost layer, the corona. The solar wind usually reaches Earth with a velocity around 400 km/s, density around 5 ions/cm3 and magnetic field intensity around 2–5 nT (nanoteslas; Earth's surface field is typically 30,000–50,000 nT). These are typical values. During magnetic storms, in particular, flows can be several times faster; the interplanetary magnetic field (IMF) may also be much stronger. The IMF originates on the Sun, related to the field of sunspots, and its field lines (lines of force) are dragged out by the solar wind. That alone would tend to line them up in the Sun-Earth direction, but the rotation of the Sun skews them (at Earth) by about 45 degrees, so that field lines passing Earth may actually start near the western edge ("limb") of the visible sun. Earth's magnetosphere is the space region dominated by its magnetic field. It forms an obstacle in the path of the solar wind, causing it to be diverted around it, at a distance of about 70,000 km (before it reaches that boundary, typically 12,000–15,000 km upstream, a bow shock forms). The width of the magnetospheric obstacle, abreast of Earth, is typically 190,000 km, and on the night side a long "magnetotail" of stretched field lines extends to great distances. The aurora is a common occurrence in the Poles. It is occasionally seen in temperate latitudes, when a strong magnetic storm temporarily expands the auroral oval. Large magnetic storms are most common during the peak of the eleven-year sunspot cycle or during the three years after that peak. See also: Error: Template must be given at least one article name However, within the auroral zone the likelihood of an aurora occurring depends mostly on the slant of IMF lines (known as Bz), being greater with southward slants. Geomagnetic storms that ignite auroras actually happen more often during the months around the equinoxes. It is not well understood why geomagnetic storms are tied to Earth's seasons while polar activity is not. But it is known that during spring and autumn, the interplanetary magnetic field and that of Earth link up. At the magnetopause, Earth's magnetic field points north. When Bz becomes large and negative (i.e., the IMF tilts south), it can partially cancel Earth's magnetic field at the point of contact. South-pointing Bz's open a door through which energy from the solar wind can reach Earth's inner magnetosphere. The peaking of Bz during this time is a result of geometry. The interplanetary magnetic field (IMF) comes from the Sun and is carried outward with the solar wind. Because the Sun rotates the IMF has a spiral shape. Earth's magnetic dipole axis is most closely aligned with the Parker spiral in April and October. As a result, southward (and northward) excursions of Bz are greatest then. However, Bz is not the only influence on geomagnetic activity. The Sun's rotation axis is tilted 8 degrees with respect to the plane of Earth's orbit. Because the solar wind blows more rapidly from the Sun's poles than from its equator, the average speed of particles buffeting Earth's magnetosphere waxes and wanes every six months. The solar wind speed is greatest — by about 50 km/s, on average — around 5th September and 5th March when Earth lies at its highest heliographic latitude. Still, neither Bz nor the solar wind can fully explain the seasonal behavior of geomagnetic storms. Those factors together contribute only about one-third of the observed semiannual variation. The ultimate energy source of the aurora is the solar wind flowing past the Earth. The magnetosphere and solar wind consist of plasma (ionized gas), which conducts electricity. It is well known (since Michael Faraday's [1791 - 1867] work around 1830) that when an electrical conductor is placed within a magnetic field while relative motion occurs in a direction that the conductor cuts across (or is cut by), rather than along, the lines of the magnetic field, an electrical current is said to be induced into that conductor and electrons will flow within it. The amount of current flow is dependent upon a) the rate of relative motion and b) the strength of the magnetic field, c) the number of conductors ganged together and d) the distance between the conductor and the magnetic field, while the direction of flow is dependent upon the direction of relative motion. Dynamos make use of this basic process ("the dynamo effect"), any and all conductors, solid or otherwise are so affected including plasmas or other fluids. In particular the solar wind and the magnetosphere are two electrically conducting fluids with such relative motion and should be able (in principle) to generate electric currents by "dynamo action", in the process also extracting energy from the flow of the solar wind. The process is hampered by the fact that plasmas conduct easily along magnetic field lines, but not so easily perpendicular to them. So it is important that a temporary magnetic connection be established between the field lines of the solar wind and those of the magnetosphere, by a process known as magnetic reconnection. It happens most easily with a southward slant of interplanetary field lines, because then field lines north of Earth approximately match the direction of field lines near the north magnetic pole (namely, into Earth), and similarly near the south magnetic pole. Indeed, active auroras (and related "substorms") are much more likely at such times. Electric currents originating in such way apparently give auroral electrons their energy. The magnetospheric plasma has an abundance of electrons: some are magnetically trapped, some reside in the magnetotail, and some exist in the upward extension of the ionosphere, which may extend (with diminishing density) some 25,000 km around Earth. Bright auroras are generally associated with Birkeland currents (Schield et al., 1969; Zmuda and Armstrong, 1973) which flow down into the ionosphere on one side of the pole and out on the other. In between, some of the current connects directly through the ionospheric E layer (125 km); the rest ("region 2") detours, leaving again through field lines closer to the equator and closing through the "partial ring current" carried by magnetically trapped plasma. The ionosphere is an ohmic conductor, so such currents require a driving voltage, which some dynamo mechanism can supply. Electric field probes in orbit above the polar cap suggest voltages of the order of 40,000 volts, rising up to more than 200,000 volts during intense magnetic storms. Ionospheric resistance has a complex nature, and leads to a secondary Hall current flow. By a strange twist of physics, the magnetic disturbance on the ground due to the main current almost cancels out, so most of the observed effect of auroras is due to a secondary current, the auroral electrojet. An auroral electrojet index (measured in nanotesla) is regularly derived from ground data and serves as a general measure of auroral activity. However, ohmic resistance is not the only obstacle to current flow in this circuit. The convergence of magnetic field lines near Earth creates a "mirror effect" which turns back most of the down-flowing electrons (where currents flow upwards), inhibiting current-carrying capacity. To overcome this, part of the available voltage appears along the field line ("parallel to the field"), helping electrons overcome that obstacle by widening the bundle of trajectories reaching Earth; a similar "parallel voltage" is used in "tandem mirror" plasma containment devices. A feature of such voltage is that it is concentrated near Earth (potential proportional to field intensity; Persson, 1963), and indeed, as deduced by Evans (1974) and confirmed by satellites, most auroral acceleration occurs below 10,000 km. Another indicator of parallel electric fields along field lines are beams of upwards flowing O+ ions observed on auroral field lines. While this mechanism is probably the main source of the familiar auroral arcs, formations conspicuous from the ground, more energy might go to other, less prominent types of aurora, e.g. the diffuse aurora (below) and the low-energy electrons precipitated in magnetic storms (also below). Some O+ ions ("conics") also seem accelerated in different ways by plasma processes associated with the aurora. These ions are accelerated by plasma waves, in directions mainly perpendicular to the field lines. They therefore start at their own "mirror points" and can travel only upwards. As they do so, the "mirror effect" transforms their directions of motion, from perpendicular to the line to lying on a cone around it, which gradually narrows down. In addition, the aurora and associated currents produce a strong radio emission around 150 kHz known as auroral kilometric radiation (AKR, discovered in 1972). Ionospheric absorption makes AKR observable from space only. These "parallel voltages" accelerate electrons to auroral energies and seem to be a major source of aurora. Other mechanisms have also been proposed, in particular, Alfvén waves, wave modes involving the magnetic field first noted by Hannes Alfvén (1942), which have been observed in the lab and in space. The question is however whether this might just be a different way of looking at the above process, because this approach does not point out a different energy source, and many plasma bulk phenomena can also be described in terms of Alfvén waves. Other processes are also involved in the aurora, and much remains to be learned. Auroral electrons created by large geomagnetic storms often seem to have energies below 1 keV, and are stopped higher up, near 200 km. Such low energies excite mainly the red line of oxygen, so that often such auroras are red. On the other hand, positive ions also reach the ionosphere at such time, with energies of 20-30 keV, suggesting they might be an "overflow" along magnetic field lines of the copious "ring current" ions accelerated at such times, by processes different from the ones described above. Dynamo action with the solar wind flowing past Earth, possibly producing quiet auroral arcs ("directly driven" process). The circuit of the accelerating currents and their connection to the solar wind are uncertain. Dynamo action involving plasma squeezed towards Earth by sudden convulsions of the magnetotail ("magnetic substorms"). Substorms tend to occur after prolonged spells (hours) during which the interplanetary magnetic field has an appreciable southward component, leading to a high rate of interconnection between its field lines and those of Earth. As a result the solar wind moves magnetic flux (tubes of magnetic field lines, moving together with their resident plasma) from the day side of Earth to the magnetotail, widening the obstacle it presents to the solar wind flow and causing it to be squeezed harder. Ultimately the tail plasma is torn ("magnetic reconnection"); some blobs ("plasmoids") are squeezed tailwards and are carried away with the solar wind; others are squeezed towards Earth where their motion feeds large outbursts of aurora, mainly around midnight ("unloading process"). Geomagnetic storms have similar effects, but with greater vigor. The big difference is the addition of many particles to the plasma trapped around Earth, enhancing the "ring current" which it carries. The resulting modification of Earth's field allows aurora to be visible at middle latitudes, on field lines much closer to the equator. Satellite images of the aurora from above show a "ring of fire" along the auroral oval (see above), often widest at midnight. That is the "diffuse aurora", not distinct enough to be seen by the eye. It does not seem to be associated with acceleration by electric currents (although currents and their arcs may be embedded in it) but to be due to electrons leaking out of the magnetotail. Any magnetic trapping is leaky--there always exists a bundle of directions ("loss cone") around the guiding magnetic field lines where particles are not trapped but escape. In the radiation belts of Earth, once particles on such trajectories are gone, new ones only replace them very slowly, leaving such directions nearly "empty". In the magnetotail, however, particle trajectories seem to be constantly reshuffled, probably when the particles cross the very weak field near the equator. As a result, the flow of electrons in all directions is nearly the same ("isotropic"), and that assures a steady supply of leaking electrons. The energization of such electrons comes from magnetotail processes. The leakage of negative electrons does not leave the tail positively charged, because each leaked electron lost to the atmosphere is quickly replaced by a low energy electron drawn upwards from the ionosphere. Such replacement of "hot" electrons by "cold" ones is in complete accord with the 2nd law of thermodynamics. Other types of aurora have been observed from space, e.g. See also: Error: Template must be given at least one article name "poleward arcs" stretching sunward across the polar cap, the related "theta aurora", and "dayside arcs" near noon. These are relatively infrequent and poorly understood. There are other interesting effects such as flickering aurora, "black aurora" and subvisual red arcs. In addition to all these, a weak glow (often deep red) has been observed around the two polar cusps, the "funnels" of field lines separating the ones that close on the day side of Earth from lines swept into the tail. The cusps allow a small amount of solar wind to reach the top of the atmosphere, producing an auroral glow. Jupiter aurora. The bright spot at far left is the end of field line to Io; spots at bottom lead to Ganymede and Europa. Both Jupiter and Saturn have magnetic fields much stronger than Earth's (Jupiter's equatorial field strength is 4.3 gauss, compared to 0.3 gauss for Earth), and both have large radiation belts. Aurora has been observed on both, most clearly with the Hubble Space Telescope. Uranus and Neptune have also been observed to have aurorae. The auroras on the gas giants seem, like Earth's, to be powered by the solar wind. In addition, however, Jupiter's moons, especially Io, are powerful sources of auroras on Jupiter. These arise from electric currents along field lines ("field aligned currents"), generated by a dynamo mechanism due to the relative motion between the rotating planet and the moving moon. Io, which has active volcanism and an ionosphere, is a particularly strong source, and its currents also generate radio emissions, studied since 1955. Aurorae have also been observed on Io, Europa, and Ganymede themselves, e.g., using the Hubble Space Telescope. These are generated when Jupiter's magnetospheric plasma impact their very thin atmospheres. Auroras have also been observed on Venus and Mars. Because Venus has no intrinsic (planetary) magnetic field, Venusian aurorae appear as bright and diffuse patches of varying shape and intensity, sometimes distributed across the full planetary disc. Venusian aurorae are produced by the impact of electrons originating from the solar wind and precipitating in the night-side atmosphere. An aurora was also detected on Mars, on August 14 2004, by the SPICAM instrument aboard Mars Express. The aurora was located at Terra Cimmeria, in the region of 177° East, 52° South. The total size of the emission region was about 30 km across, and possibly about 8 km high. By analyzing a map of crustal magnetic anomalies compiled with data from Mars Global Surveyor, scientists observed that the region of the emissions corresponded to an area where the strongest magnetic field is localized. This correlation indicates that the origin of the light emission actually was a flux of electrons moving along the crust magnetic lines and exciting the upper atmosphere of Mars. Auroral electrons come from beams emitted by the Sun. This was claimed around 1900 by Kristian Birkeland, whose experiments in a vacuum chamber with electron beams and magnetized spheres (miniature models of Earth or "terrellas") showed that such electrons would be guided towards the polar regions. Problems with this model included absence of aurora at the poles themselves, self-dispersal of such beams by their negative charge, and more recently, lack of any observational evidence in space. The aurora is the overflow of the radiation belt ("leaky bucket theory"). This was first disproved around 1962 by James Van Allen and co-workers, who showed that the high rate at which energy was dissipated by the aurora would quickly drain all that was available in the radiation belt. Soon afterwards it became clear that most of the energy in trapped particles resided in positive ions, while auroral particles were almost always electrons, of relatively low energy. The aurora is produced by solar wind particles guided by Earth's field lines to the top of the atmosphere. This holds true for the cusp aurora, but outside the cusp, the solar wind has no direct access. In addition, the main energy in the solar wind resides in positive ions; electrons only have about 0.5 eV (electron volt), and while in the cusp this may be raised to 50–100 eV, that still falls short of auroral energies. Images of aurora are significantly more common today due to the rise of use of digital cameras that have high enough sensitivities. Film and digital exposure to auroral displays is fraught with difficulties, particularly if faithfulness of reproduction is an objective. Due to the different spectral energy present, and changing dynamically throughout the exposure, the results are somewhat unpredictable. Different layers of the film emulsion respond differently to lower light levels, and choice of film can be very important. Longer exposures aggregate the rapidly changing energy and often blanket the dynamic attribute of a display. Higher sensitivity creates issues with graininess. David Malin pioneered multiple exposure using multiple filters for astronomical photography, recombining the images in the laboratory to recreate the visual display more accurately. For scientific research, proxies are often used, such as ultra-violet, and re-coloured to simulate the appearance to humans. Predictive techniques are also used, to indicate the extent of the display, a highly useful tool for aurora hunters. Terrestrial features often find their way into aurora images, making them more accessible and more likely to be published by the major websites. It is possible to take excellent images with standard film (using ISO ratings between 100 and 400) and a single-lens reflex camera with full aperture, a fast lens (f1.4 50mm, for example), and exposures between 10 and 30 seconds, depending on the aurora's display strength. Early work on the imaging of the Aurora was done in 1949 by the University of Saskatchewan using the SCR-270 radar. While a striking notion, there is not a vast body of evidence in the Old Norse literature supporting this assertion. Although auroral activity is common over Scandinavia and Iceland today, it is possible that the Magnetic North Pole was considerably further away from this region during the centuries before the documentation of Norse mythology, thus explaining the lack of references. The first Old Norse account of norðurljós is found in the Norwegian chronicle Konungs Skuggsjá from AD 1230. The chronicler has heard about this phenomenon from compatriots returning from Greenland, and he gives three possible explanations: that the ocean was surrounded by vast fires, that the sun flares could reach around the world to its night side, or that glaciers could store energy so that they eventually became fluorescent. An old Scandinavian name for northern lights translates as "herring flash". It was believed that northern lights were the reflections cast by large swarms of herring onto the sky. Another Scandinavian source refers to "the fires that surround the North and South edges of the world". This has been suggested as evidence that the Norse ventured as far as Antarctica, although this is insufficient to form a conclusion. The Finnish name for northern lights is revontulet, fox fires. According to legend, foxes made of fire lived in Lapland, and revontulet were the sparks they whisked up into the atmosphere with their tails. In Estonian they are called virmalised, spirit beings of higher realms. In some legends they are given negative characters, in some positive ones. The Sami people believed that one should be particularly careful and quiet when observed by the northern lights (called guovssahasat in Northern Sami). Mocking the northern lights or singing about them was believed to be particularly dangerous and could cause the lights to descend on the mocker and kill him/her. The Algonquin believed the lights to be their ancestors dancing around a ceremonial fire. In Latvian folklore northern lights, especially if red and observed in winter, are believed to be fighting souls of dead warriors, an omen foretelling disaster (especially war or famine). In Russian folklore aurora borealis was associated with the fire dragon ("Ognenniy Zmey"), who came to women and seduced them in the absence of their husbands. 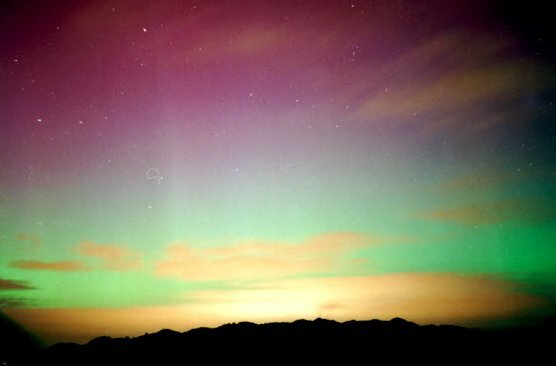 In Scotland, the northern lights were known as "the mirrie dancers" or na fir-chlis. There are many old sayings about them, including the Scottish Gaelic proverb "When the mirrie dancers play, they are like to slay." The playfulness of the mirrie dancers was supposed to end occasionally in quite a serious fight, and next morning when children saw patches of red lichen on the stones, they say among themselves that "the mirrie dancers bled each other last night". The appearance of these lights in the sky was considered a sign of the approach of unsettled weather. Many prospectors during the Klondike Gold Rush believed that the Northern Lights were the reflection of the mother lode of all gold. The Inuit people of Alaska tell the traditional tale of their ancient ancestors who are seen in the rippling movements of the northern lights. They say that the "shadows" within the display are relatives and friends who have gone to the sky and march along or dance to remind the living people of their presence. When the dogs bark and howl at the sounds of the aurora borealis, it's said that the dogs recognize their one-time companions in the colorful display. The most popular poem of the writer Robert W. Service, from the gold rush era, The Cremation of Sam McGee, begins: "The Northern Lights have seen queer sights, But the queerest they ever did see, Was the night on the marge of Lake Lebarge, I cremated Sam McGee." In The Ballad of the Northern Lights, Service refers to the theory that the source of the glow is an enormous deposit of radium in the polar region. The aurora features prominently in Philip Pullman's Northern Lights, and less prominently in the film adaptation, The Golden Compass. Characters in the story can sometimes see glimpses of another universe through the lights. Syun-Ichi Akasofu (April 2002). "Secrets of the Aurora Borealis". Alaska Geographic Series (Graphic Arts Center Publishing Company) 29 (1). Phillips, Tony (October 21 2001). "'tis the Season for Auroras". NASA. Retrieved on 2006-05-15. ↑ Bibliographical History of Electricity and Magnetism by Paul Fleury Mottelay. Published by Read Books, 2007, ISBN 1406754765. p 114. ↑ Birkeland, Kristian (1908). "The Norwegian Aurora Polaris Expedition 1902-3." ↑ Fritz, Hermann (1881). "Das Polarlicht." ↑ Feldstein, Y. (1963). "Some problems concerning the morphology of auroras and magnetic disturbances at high latitudes", Geomagnetism and Aeronomy, 3, 183-192. ↑ 15.0 15.1 Eyewitness reports of the great auroral storm of 1859 Advances in Space Research, Volume 38, Issue 2, 2006, Pages 145-154, Green, et al. ↑ The Journal of Education for Upper Canada; The Late Aurora Borealis and the Telegraph 1858, Page 132, Ryerson, et al. ↑ Schield, M. A.; Freeman, J. W.; & Dessler, A. J. (1969) "A Source for Field-Aligned Currents at Auroral Latitudes", Journal of Geophysical Research, 74, 247-256. ↑ Armstrong J. C., & Zmuda, A. J. (1973). "Triaxial magnetic measurements of field-aligned currents at 800 kilometers in the auroral region: Initial results", Journal of Geophysical Research, 78, 6802-6807. ↑ Persson, Hans (1963). "Electric field along a magnetic line of force in a low-density plasma", Physics of Fluids, 6, 1756-1759.